I report on a phenomenological investigation into teacher experiences of generating and interpreting drawings during their participation in the Resilient Educators (REds) intervention. All 18 teacher participants came from rural communities challenged by HIV&AIDS. I reflect critically on the ambivalence in teacher experiences of drawings to highlight the complexity of employing drawings as visual method. Then, I interpret the teachers' methodological experiences through the lens ofsocial-ecological understandings of resilience in order to address the question of how drawings, as form of visual participatory methodology, may make a positive difference and nurture participant resilience. What the teachers' experiences suggest is that drawings offer methodological opportunities for participants to make constructive meaning of adversity, to take action, to experience mastery, and to regulate emotion associated with adversity. All of the aforementioned are well documented pathways to resilience. I theorise, therefore, that researchers with a social conscience would be well advised to use drawings, albeit in competent and participatory ways, as this methodology potentiates participant resilience and positive change. Although the HIV&AIDS pandemic appears to be better managed globally (the Joint United Nations Programme on HIV and AIDS [UNAIDS], 2011) and in South Africa (UNAIDS, 2011; Zuma, 2012), its insidious challenges continue to threaten teachers' positive adjustment, or resilience, to the difficulties of being a teacher in HIV&AIDS-challenged communities. Being a teacher in the age of AIDS means that many teachers grapple with the following: how to be effective, relevant prevention agents, given their inadequate training, and/or socio-cultural and personal impediments to these preventive roles; how to support learners made sorely vulnerable by living in communities affected by HIV&AIDS; and how to cope with the AIDS-related deaths of their pupils, colleagues, family, and friends (Aggleton, Yankah & Crewe, 2011; Baxen, Wood & Austin, 2011; Delport, Strydom, Theron & Geyer, 2011; Ebersohn & Ferreira, 2011; Wood & Goba, 2011). The net result of these challenges is that teacher resilience, or positive adjustment to adversity, is taxed (Theron, Geyer, Strydom & Delport, 2008; Theron, forthcoming). This reality prompted various South African research initiatives, such as STAR (Supportive Teachers, Assets, and Resources) (Ebersohn & Ferreira, 2011) and REds (Resilient Educators) (Theron et al., 2008), which aimed at enabling teachers and schools, challenged by HIV&AIDS, towards increased resilience. Teachers who participated in STAR reported capacitation as resilience agents (Ebersöhn & Ferreira, 2011; Ebersöhn, Ferreira & Mbongwe, 2011), and teachers who participated in REds reported and demonstrated enhanced resilience to the challenges of the HIV&AIDS pandemic (Delport et al., 2011; Theron, 2008; Theron, forthcoming; Theron, Geyer, Strydom & Delport, 2010; Wood, Ntaote & Theron, 2012). Both initiatives included visual participatory methodologies (particularly drawings) (Ebersöhn et al., 2011; Theron, 2008; Theron et al., 2010). While these (and other) projects have been evaluated in terms of how well they encouraged teachers and school systems to adjust positively to the trials associated with HIV&AIDS, there has been little attention to how the participatory, visual methodologies that underpinned them might have contributed to teacher resilience. Ebersöhn et al. (2011) explored how drawings enabled teacher co-researchers in the STAR project to give voice to their experience of this research partnership and used this exploration to theorise about power dynamics in longitudinal, participatory research projects. Ebersöhn et al. (2011) did note that drawings were invaluable to their inquiry, particularly because these freed teacher participants from language constraints and offered the opportunity for collective articulation of experience that respected power-sharing and cultural influences. Nevertheless, like others, Ebersöhn et al. (2011) did not consider how the visual methodologies used might have promoted teacher resilience. The rationale for the study of resilience is a transformative one: resilience-focused researchers are concerned with supporting people and systems, whose well-being has been jeopardised, towards positive adjustment. In other words, resilience researchers strive to make a positive difference (Masten, 2011). Much resilience-focused research is, therefore, currently centred on investigating how well interventions towards resilience enable people who participate in these interventions. Accordingly, researchers are engaged in designing, implementing, and evaluating programmes, policies, and experiments that aim to buffer people against the apparently intractable risks at which societies place them. Although there are specific calls for the inclusion of visual, or creative, participatory methodologies in the implementation and evaluation of resilience-focused interventions (Cameron, Theron, Ungar & Liebenberg, 2011; Liebenberg & Ungar, 2009; Masten, 2011; Masten, Monn & Supkoff, 2011), and specific calls for research and interventions that will strengthen teachers and schools as resilience-promoting ecologies (Mampane & Bouwer, 2011; Masten, Herbers, Cutuli & Lafavor, 2008; Theron & Engelbrecht, 2012), there is a dearth of literature commenting on how visual participatory methodologies themselves potentiate resilience. Therefore, the aim of this article is to document how rural teachers experienced the visual participatory methodology (teacher-generated drawings, to be precise) that was used as part of the evaluation of REds' efficacy and to comment critically on how this potentially made a positive difference or nurtured their resilience. The investigation was prompted because the quantitative instruments yielded no significant findings about how REds had galvanised teacher resilience, yet the visual participatory methods did just that. This disconnect between the quantitative and qualitative findings stimulated further inquiry into teacher experience of the two methodologies and generated the serendipitous discovery that visual participatory methodologies had resilience-promoting potential in and of themselves. Therefore, a secondary aim of this article is to theorise about how the inclusion of drawings in education and social science research designs can potentially make a positive difference to the resilience of participants challenged by adversity. In summary, the question that underpins this article is as follows: "How do teacher participants experience visual participatory methodology (drawings in particular), and how might this methodology nurture participant resilience, when participants come from communities challenged by adversity?" 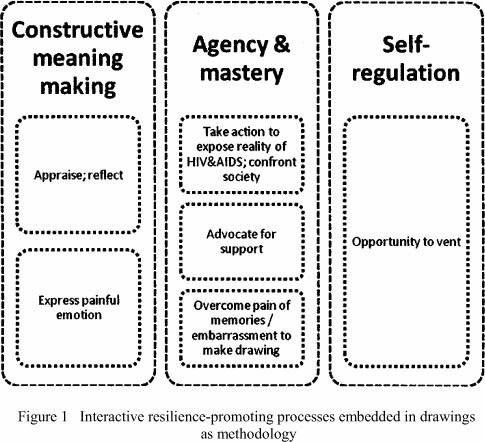 In order to illustrate how drawings, as a form of visual participatory research, have the potential to encourage resilience, it is necessary to provide a synopsis of the mechanisms that underpin resilience. Resilience-focused researchers concur that positive adjustment to adversity is a complex process that is variable across socio-cultural contexts, developmental stages, and time (Masten & Wright, 2010; Ungar, 2012). Increasingly, the process of adapting well to adverse contexts is being conceptualised as a "person <Â> context" (Lerner, 2006:47) transaction, or a bidirectional interaction between people and their social ecologies. Within such a social-ecological conceptualisation of resilience (Ungar, 2011, 2012), positive adjustment is partly the responsibility of the individual and partly the responsibility of the social ecology in which the individual is nested. The collaborative transactions that are typically thought to support positive adaptation are those that encourage constructive attachments, offer opportunities to behave agentically and experience mastery, facilitate constructive meaning making, promote problem solving, and encourage self-regulation (Masten, 2001, 2011; Masten & Wright, 2010). These aforementioned resilience-promoting transactions draw on multiple resources (see Table 1 for examples of these), some found within the individual (e.g. social skill) and some within the social ecology (e.g. the opportunity to develop social skills). 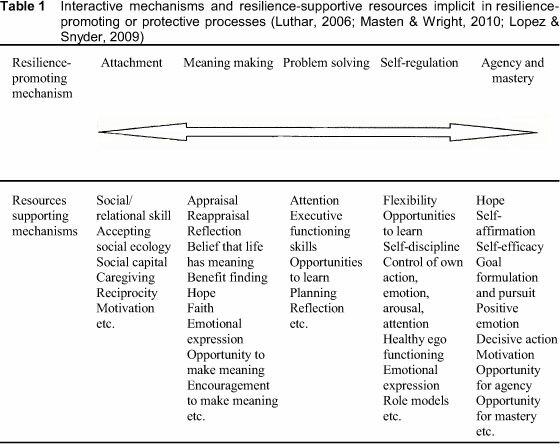 Moreover, the transactional mechanisms (see Table 1) that nurture positive adjustment are often interactive. For example, constructive meaning making might be informed by an individual reappraising an experience and expressing emotion related to the experience. Simultaneously, such meaning making implies, among others, the opportunity to express emotion or encouragement to reconsider the meaning originally attributed to the experience. Such opportunity and/or encouragement might be found in a relational attachment, or mastery experiences, or an opportunity to learn and problem-solve. Significantly, to encourage resilience, such transactions will be well aligned with the culture of a given social ecology (Masten & Wright, 2010; Ungar, 2011; 2012). Although some researchers caution that positive adjustment probably comes at a cost to the individual (Luthar & Zelazo, 2003), other researchers advocate exposure to manageable levels of adversity, as this toughens individuals and nurtures subsequent resilience (Fergus & Zimmerman, 2005; Luecken & Gress, 2010; Rutter, 2006; 2012). Because this article focuses on teachers' lived experiences of generating drawings as part of the evaluation of REds, this methodology section will focus only on how drawings were used during REds evaluations and how the phenomenological data for this current article were generated and analysed. The use of drawings as part of the evaluation protocol of REds has been documented publically, including the rationale for using drawings, how the drawings were made and co-analysed, and the resilience-confirming findings emanating from these artefacts (see Theron, 2008, forthcoming; Theron et al., 2010). In short, teacher participants were invited to make a drawing, using blank paper and coloured pencil crayons, that symbolised their experience of the pandemic and to explain what they wished to communicate via this drawing. The specific brief was: "When you think of how the pandemic has affected you, what symbol comes to mind? Please draw this symbol, and then explain what it means...". In other words, the use of participant-generated drawings followed the "draw-and-write" or "draw-and-talk" method in which participants are co-researchers who shape the final interpretation of the visual data (see Mitchell, Theron, Stuart, Smith & Campbell, 2011). As suggested in the literature, participants were reassured that the quality of their drawings was not paramount, and they were requested to explain what their drawing conveyed either in writing or verbally (Guillemin, 2004; Mitchell et al., 2011). They provided permission for other team members to view their completed drawings and explanations and for these to be reproduced. In their explanation of symbols that they had drawn, teacher participants were co-analysts of the visual data, thereby heightening the trustworthiness of the data analysis process (Theron, Stuart & Mitchell, 2011). REds participants in focus groups to explore their experiences of generating drawings. The rationale for using focus groups related to REds having followed a group -based design (Theron et al., 2008), and the two focus groups were comprised of pre-existing REds groups. The selection of these specific groups was convenient (Creswell, 2009): both groups were readily accessible because of strong research ties to the communities in which these participants resided. This form of sampling is potentially biased, however, and so it is important that its limitations be borne in mind when the findings are considered. All participants had completed written consent procedures prior to their participation in REds, and this consent was confirmed (along with the standard reassurances of anonymous reporting, voluntary participation, right to withdraw, possible risks given the HIV&AIDS-focus of REds, and reminders of the ethical limitations of focus group research) (Creswell, 2009). As summarised in Table 2, the focus group participants were very similar, although they came from different primary schools. The focus group discussions were unstructured and guided by a broad initial brief: "Please help us to understand what it was like to make and explain drawings during the REds pre- and post-tests." The question excluded reference to dissemination because, at the time of these focus groups, REds participants had not yet disseminated their drawings as public messages, but were engaged in processes of considering how this might be done. The discussion was mostly in English, with occasional use of Sesotho, and lasted approximately 50 minutes in both groups. The fieldworkers probed participant responses as necessary. The fieldworkers transcribed (and, where necessary, translated) the content of the focus group discussion and asked participants to confirm its accuracy. I analysed the content inductively, using a "conventional content analysis" approach (Hsiu-Fang & Shannon, 2005:1279). I invited the fieldworkers and experienced academics to comment critically on the initial analysis and used this to refine subsequent interpretation, thereby enhancing trustworthiness (Creswell, 2009). Teacher participants' experiences of generating drawings were mostly constructive. In this regard, three broad themes emerged, namely, that drawings offered the opportunity for re- flection, for emotional expression, and for active confrontation. However, these themes were moderated by a fourth less positive theme: mindfulness of the potential of drawings to do harm. Most participants reported that generating and interpreting drawings supported them to reflect on their lived experiences as teachers in the age of HIV&AIDS, particularly their experiences of pain and loss. This was intrinsically tied to participants being asked to draw a metaphor or symbol of their experience as teachers in the age of AIDS, which meant that they needed to ponder what HIV&AIDS had introduced into their lives. This called for deliberate appraisal of what they had come to know first-hand. For example, Participant 3 in Focus Group 1 observed: "Drawings tell us ... show us what is happening, not like the questionnaire that'sjust to fill in what you think. Drawings say a lot more [because] it give each one some soul searching." Participant 7 agreed that drawings encouraged scrutiny of experience: "Drawings gave me time to think and analyse". Likewise, Participant 1 in Focus Group 2 commented: "Drawings made me to think and search, not just to write what I think I know about H1V& AIDS." The participants also considered that such meaning making was not limited to the person generating the drawing, but that drawings urged viewers to reflect and make further meaning. As Participant 2 (Focus Group 1) suggested: "Drawings tell more . because when someone sees the drawing, she thinks more, or in detail, what is the meaning of the drawing." Participant 8: "I liked the drawing because it did allow me to express my feelings." Participant 6: "Yes, I have voiced out my feelings through drawing. It was healing." Participant 2: "I liked the drawing because that's where I was taking out my feelings. It made me to feel better." Participant 5: "The drawing explained the pain I felt about those people who are infected by this pandemic or disease and the family of those who are infected." Participant 9: "The drawing explained my feelings ... that is, where I have expressed myself, the way I feel about this dreaded disease. It made me to understand better." "They say: 'Actions speak louder than words. ' So pictures do the same" (Participant 4). "The drawings deliver the message" (Participant 1). "Yes, they can explain what the person wants to say even if he/she can't express his/her feelings" (Participant 5). "The drawing reveals what happens in our real life situation and that we can't close our eyes like as if there is nothing" (Participant 10). "It reminds others about this pandemic. It will be an eye-opener to all" (Participant 7). "I like to show the people what is happening in my world. Now they will know they must bring support" (Participant 4). "Ja [yes], you see, the drawing says a lot and it tells exactly what is happening in our society. I think it expresses or delivers the message more clearly than words can do. People out there need this message" (Participant 3). "What I did not like about doing this drawing was that I struggle to do it as I am not good in drawing so I thought the facilitator will laugh at my drawing without understanding what does it mean. This was not in fact the case, but the drawing is awkward for me." "It was very difficult to draw as it reminded me of people with HIV/AIDS. It did hurt a lot" (Participant 10, Focus Group 2). "It makes me to feel upset... it is because when you look at the drawing you think about a person who is affected by HIV/AIDS. A real person" (Participant 5, Focus Group 2). "It remind us about late friends, relatives and what is happening in our community. This brings a pain" (Participant 6, Focus Group 1). "It also made me feel deeper about this monster, how people are dying, old and young, and to think there is no remedy for this. Drawing made me to think about this. So it brought pain, but it was also good" (Participant 8, Focus Group 1). At face value, participant experience of generating drawings suggests ambivalent inferences about the value of drawings to make a positive difference to participants and their communities. The dualistic inferences foreground the complexities of using drawings as a research tool. This complexity, in turn, draws attention to the need for sensitive, careful application of drawing-based methodologies and awareness that it is not an emotionally neutral methodology. On the plus side, drawings offered teacher participants the opportunity to take part in research activity in ways that encouraged them to reflect on their lived experiences of HIV& AIDS, to express their emotion relating to HIV&AIDS - this brought relief - and to create artefacts that could be used to make public the reality of HIV&AIDS and advocate support towards coping with this reality. These findings speak to the potential of drawings to make a positive difference and make a case for the use of drawings, specifically, and visual partici- patory designs, more generally. Participant belief that drawings offered them an opportunity to stem denialism, to confront society with the reality of HIV&AIDS, and to advocate support highlights that dissemination is crucial to how drawing-based methodologies make a positive difference. On the negative side, it seemed that generating drawings was associated, albeit infrequently, with disquiet (when participants were sceptical about their ability to draw) and distress (when participants were reminded of AIDS-related losses). This speaks to the potential of drawings (like many other research methods) to do harm and foregrounds the need for ethical implementation of drawings as research methodology. At the very least, researchers need to be vigilant about the need to reassure participants that drawing skill will not be judged (Mitchell et al., 2011). However, researchers may need to do more than just reassure; perhaps they could join in the drawing activity and offer their drawing to participants for scrutiny; perhaps they should encourage group-based rather than individual drawing (as done by Ebersohn et al., 2011). More importantly, though, the distress that participants experienced when the research activity prompted painful memories is a reminder that participants need to be fully informed up front of the possible risks inherent in their participation and that researchers need to be able to debrief participants competently and refer them to local professionals, if necessary (Creswell, 2009; Theron et al., 2011). Their distress also raises questions about the need for researchers to be supported to develop basic counselling skills, particularly when conducting research into sensitive issues. A further question relates to the researchers themselves: were they aware of the participants' distress during the generation of the drawings, and if so, how did they cope with this awareness? How did the researchers experience viewing the participants' drawings, and how did this experience impact them? How did they experience participants' wishes to take the drawings back to their communities and publically disseminate their lived experiences of HIV&AIDS? The implication is that when visual methodologies are employed to explore sensitive issues, researchers themselves need prior sensitisation to the potential impact of drawings as mode of inquiry, representation, and dissemination. Although visual participatory researchers are scientists, they are also witnesses to, and participants in, the inquiry, representation, and dissemination phases (Mitchell et al., 2011). As such, they will probably need the opportunity for debriefing and possibly even counselling. When participants' experiences of generating drawings are interpreted through the lens of social-ecological understandings of resilience (Masten & Wright, 2010; Ungar, 2011, 2012), it seems probable that the process of making and interpreting drawings dedicated to the exploration of experiences of adversity (in this instance, HIV&AIDS) and the po ssibility of using these drawings to publically document lived experiences of adversity potentiated positive adjustment (see Figure 1). Both the positive and negative experiences of generating drawings can be aligned with the fundamental protective systems reported as generic to resilience-promoting processes (Cicchetti, 2010; Luthar, 2006; Masten, 2001, 2011; Masten et al., 2011; Masten & Wright, 2010; also see Table 1). In the process of generating and interpreting their drawings and considering what the social impact of their drawings could be, participants were supported to make constructive meaning, be agentic and experience (as well as anticipate) mastery, and self-regulate. For example, when participants reflected deeply on their lived experiences and illustrated these metaphorically, and when they projected their emotion onto and through these symbols, they were engaged in making meaning of what the HIV&AIDS pandemic had brought across their life paths. Their channelling of painful emotion offered the opportunity to vent safely and to regulate emotion. When participants understood their drawn symbols to be potentially public messages that might draw attention to the insidious realities of HIV&AIDS and/or might be used to advocate teacher support, experiences of agency were potentiated. When teacher participants rose above the pain triggered by recollection of others' suffering or personal losses, or the fear of unskilled drawings, they knew mastery. These drawing-facilitated examples testify to the core protective systems known to buffer people placed at risk of maladjusted outcomes (Cicchetti, 2010; Luthar, 2006; Masten, 2001, 2011; Masten et al., 2011; Masten & Wright, 2010). Moreover, participant references to embarrassment and/or painful memories appear to lend credence to thinking that exposure to tolerable levels of adversity can be fortifying, given that these experiences did not prevent participants from generating drawings and interpreting these (Fergus & Zimmerman, 2005; Luecken & Gress, 2010; Rutter, 2006, 2012). In summary, participant interpretations of their experience of generating drawings intimate that drawings offer a methodological pathway to resilience. This working hypothesis needs some cautioning. The participatory, voluntary nature of the use of drawings in REds might have predisposed their potential to encourage resilience, given that resilience processes are grounded in collaborative transactions (Lerner, 2006; Ungar, 2012). In other words, teacher participants agreed to collaborate with researchers when they were invited to generate drawings and co-analyse these, and this might well have influenced the agency, mastery, meaning-making, and self-regulation potential inherent in the methodology. Had teacher participants felt coerced, or had they not co-analysed their drawings, or had the quality of their drawings prompted judgement, or had they not foreseen the possibility of being able to disseminate their drawings in their communities and more broadly, the resilience-promoting potential of drawings as a methodology would have been truncated. Using drawings in education and social science research designs can potentially make a positive difference to participants challenged by adversity. Based on teacher participants' reported experiences of drawings as methodological tool and interpreted through the lens of a social-ecological theory of resilience, this positive difference appears to encompass resilience promotion. Although there are caveats to this working hypothesis - most notably its origin in two conveniently selected groups of participants with fairly homogenous demographics, and mindfulness of the complex experiences that drawings as mode of inquiry, representation, and dissemination bring to participants and researchers - it does offer researchers a potential means of doing more than generating rich data. In a country such as South Africa, where most people struggle to adjust well to multiple adversities, researchers have a duty to care and a moral obligation to engage in research that makes a positive difference, that brings hope, and that advocates positive change (Adler & Hansen, 2012; Schratz & Walker, 1995). Essentially, the suggestion that drawings (as methodological vehicle) offer participants, who are struggling (albeit well) with some form of adversity, an opportunity to make meaning, be agentic, experience or anticipate mastery, and regulate their emotion means that researchers who "dare to care" (Adler & Hansen, 2012:129) should include drawings - cautiously - as part of their methodological repertoire. An embryonic version of the contents of this article was presented as a paper at the following international symposium: Every Voice Counts: Critical partnerships for teacher education and rural communities. Durban, 27-28 February 2009. I am grateful to conference delegates for their developmental comments, which helped to shape my initial thoughts.